Switzerland – As Atlona prepares to celebrate its 15th year in business, the company has launched a series of “Launch & Learn” events for partners, including Atlona distributors and systems integrators. The goal of each event is to bring attendees up to speed on how recent Atlona innovations correlate with today’s most important industry trends, including AV over IP and networked control. The first event, which took place 19th - 20th October at Atlona’s international headquarters near Zurich, Switzerland, offered two distinct educational tracks: Networked AV and Modern Meeting Spaces. 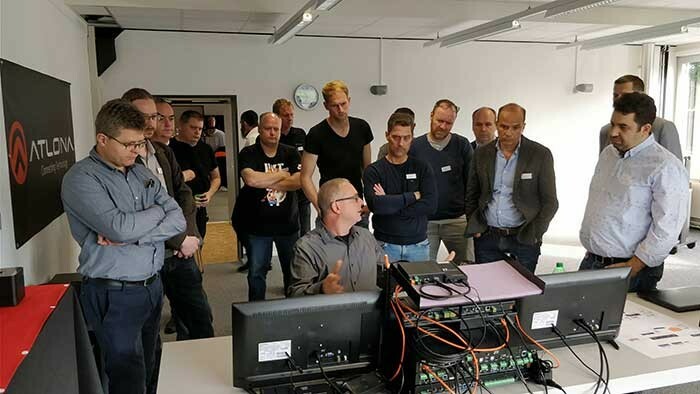 Attendees from 50 companies were provided with hands-on demonstrations of Atlona’s now-shipping OmniStream AV over IP and Velocity networked control platforms, along with detailed case studies on early installations. The event was rounded out with informative Q&A sessions, social activities and a long-term product development roadmap. Additional Launch & Learn events are expected in 2018.